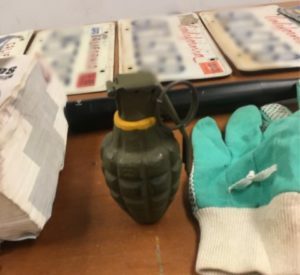 NEWHALL – Two men were arrested on suspicion of multiple felony charges after a traffic stop conducted in Newhall revealed the pair was in possession of drugs, weapons, burglary tools and multiple license plates, the sheriff’s department announced. The stop was made on Friday, March 15, according to the Santa Clarita Valley Sheriff’s Station. “Deputies were patrolling on Orchard Village Road around 7:30 a.m. when they ran a routine license plate check on a pick-up truck that came back as ‘STOLEN.’ A traffic stop was initiated and deputies made contact with two adult males in the vehicle,” SCV Sheriff’s officials said on social media. The men were found to be in possession of heroin and methamphetamine for sales, a dirk/dagger, billy club, a replica hand grenade, counterfeit U.S. currency, burglary tools, multiple license plates and numerous vintage items of high value, authorities said. Deputies arrested Michael Tupper, 31, of Santa Barbara and Christopher Pollay, 36, of Newbury Park on multiple charges. The two men were booked at the Santa Clarita Valley Sheriff’s Station, where Pollay remains in custody on $180,500 bail and Tupper on $30,000 bail. 1 comment for "Deputies arrest two men in Newhall for multiple felonies"
I wonder what time these two losers will get with recent changes to the California penal code.